If you like this theme please don’t forget to spread the word, like it, share it so other people can try it too. Thanks in advance! Carbon Light is a fully responsive HTML5/CSS3 WordPress theme. Suitable for Business, Service, Portfolio websites. It has clean and minimalist design that is very easy to customize. It comes packed with a whole lot of code-snippets. Check out Carbon light demo site for more ideas and better understanding the features. Install this theme like a standard WordPress theme. Check the manual on WordPress theme installation. Once installed the theme will automatically install the WooSlider plugin and will ask you to activate it. More on the slider see bellow in the Slider section. Smart Post Lists – Builds post lists based on options you choose from a form in a widget. It supports custom post types as well. Widgetize Pages Light – a free plugin that will help you widgetize pages. Sidebar Manager Light – a free plugin that can replace your theme’s sidebars for a set of pages. Widget Manager Light – a free plugin that can help you hide/show widgets on any set of pages. Smart Post Lists Light – a free plugin that can create lists of posts. The theme comes with two menus Primary menu and Footer menu that you can set up in Appearance -> Menus. More info on how to manage menus in WordPress is available in the codecs. Navigation label – the label that appears in the menu. It can be different form the original page title. 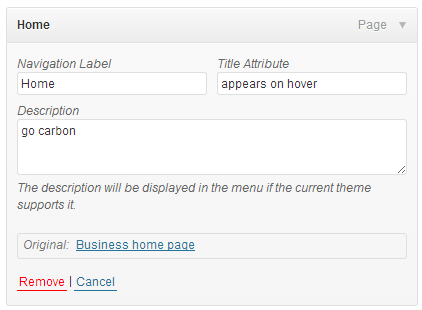 Title attribute – this will appear on hover. It is optional. Description – this is the description bellow the Navigation label. It is available for sub-menu items as well. If this is not available when you first install your theme you can enable it by clicking on the Screen options button on the top right corner of Appearance -> Menus page. Footer menu is displayed in the footer section on the left side next to the copyright text. By default both menus – Primary menu and Footer menu will display the list of pages if you haven’t set up any menus in Appearance -> Menus. We recommend you set this up to have more control on what you display in your site. You can check out all templates in action on the theme’s Demo site, see the link in the description above. You can also check out Demo pages section bellow to see how we have build some of the pages and get the codes. More info on what are Page templates and how to use them is available in the WordPress codex. Default template – it will display the content you put in the editor and it will place the default sidebar(Sidebar Widgets) on the right. Blog 1 column – it will display the blog posts from all categories and tags sorted by date in a nice way with a big image, title, meta and excerpt. It will also place the default sidebar on the right. Page Contact – you can change the map, all contact info by editing this file page-contact.php. The following two come with the free OTW Portfolio Light plugin via shortcodes. Portfolio Filterable – this template will display all your portfolio items. It will add a filter on top of it that will let your users choose items by portfolio category. It will change category listing with a cool animation. More on how to set up the portfolio bellow in the Portfolio section. 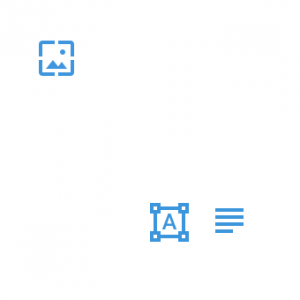 Portfolio Paginated – this will display all portfolio items and it will add pagination bellow. The number of items per page can be set up in Settings -> Reading -> Blog pages show at most. Note that this setting is also valid for all blog archives and the Blog 1 column page template. A copy of the codes that are in the Codesnippets page on the demo site can be downloaded in a text file: codesnippets-page-codes.txt. The layout is based on a 24 columns responsive grid system. This makes it very flexible and powerful. Works on all kinds of modern browsers and devices. This modification can be done in the header.php file. This modification can be done in the header.php file. The page-content div wrapper is right before the header wrapper. This modification can be done in the header.php file. The page-title-wrapper div wrapper is right after the header wrapper. This modification can be done in the footer.php file. The theme by default will not come boxed. But it can be easily turned into boxed layout theme. In the header.php file there is an empty div wrapper right before the page-content wrapper. You need to add id=”boxed-layout” to that empty wrapper to make the whole theme boxed layout. Once you have this set up you can do some custom css modifications on the #boxed-layout to add a custom background outside of the box, to add padding no top and bottom of your box. Please refer to OTW Portfolio Light documentation for more info on how to set up the portfolio. The theme basically works just like any other WordPress theme. Add some posts from the posts menu. Categorize them, add some tags too. Find more info on managing posts in WordPress in the codex. Add featured images to your posts. The images will be displayed in all kinds of post lists. The images will be cropped automatically. Once you have some posts, categories, tags the theme will automatically create archives for your posts – category archives, tag archives, monthly archives, author archives, latest posts for home page. All with sidebar on the right. You can create a page of posts that looks a bit fancier. Create a new page, choose page template Blog 1 column and you will have a beautiful page of posts with a sidebar on the right. You can set up how many items you want to have per page/archive in Settings -> Reading -> Blog pages show at most. Note that this settings applies for both Portfolio lists and Blog lists/archives. Check out the Demo site for blog examples. The theme comes with too sidebars by default – Sidebar widgets, Footer widgets. For more info on how sidebars and widgets work please refer to WordPress codex. This sidebar is displayed on the right side on all pages except the portfolio templates, and page template Page wide. When you have your Footer widgets sidebar empty you have the boxes empty. When you drop one widget in the sidebar it displays in the first box on the left. The second widget will go in the second box. And so on. For more control over sidebars and widgets – replacing sidebars for a set of pages/posts, setting widget visibility, as well as creating widgetized pages (custom layouts using sidebars) please refer to Recommended plugin section above. You can easily be able to tweek your theme however you like by using some of the plugins in the list. Once installed the theme will install the WooSlider plugin and will ask you to activate it. Once you do you will be able to use the plugin to create slideshows and blogrolls. Bellow we will briefly show you how to use the slider in the cases we have used it for the Demo site, which basically covers most of it. According to the WooSlider license terms we are free to distribute it with this free theme or change it however we like because it is GPL licensed. You are free to do the same. If you require further assistance or you have any issues with the slider please note that you need to contact the Woothemes and most probably need to purchase a copy so you can get support and updates. Other than that you are free to use it. There is a Slideshows menu available in the WordPress left menu. You can add as many slideshows there as you like. You can also group the slideshows which we recommend. A slideshow is basically a slide that the slider can slide. A slideshow can be any HTML code. You can place images, texts, links, embed videos, etc. Once you have the slideshows set up you can create a new page, click on Add Media, then on the Slideshows tab. In this tab choose Slides in the Slideshow Type dropdown. Then do the settings bellow, most importantly select the Slide Groups you want your slider to display. Once you are done with that click on Insert slideshow button. This will generate a shortcode based on the settings you have selected. Once the shortcode is in your page content editor, save the page and see the result. Some examples can be seen on the Demo site under the Home menu – Business home page, Services home page and Slideshow sliders. Then we have created a new page an inserted a slider shortcode for our slideshows group the same way as described above. You can see the code example for the business home page bellow in the Demo pages section. This is created just like the above example but with 2 slideshows. The content for the slideshows is just an image, a transparent png file with all the titles and images in it. You can create one like that in photoshop for instance. The recommended size for the image is 940x420px since this slider is without a border around the slider. This is when you want to create a slider that slides posts. Images that are used are the featured images for the posts. The titles used are the post titles. And the text used is the post excerpt text. To create a slider like that create a new page, click Add Media button, go to Slideshows tabs and select Posts in the Slideshow Type dropdown. Some examples can be seen on the Demo site under the Home menu – Blogroll home page and Blogroll sliders. To add the border around the slider you need to add id=”bordered-slider” in the slider shortcode. We have kept the original slider files unmodified so it can be easily updated. In the folder \sliders\flexslider-custom\ we have added our custom stuff that overrides the original files to get the styles needed for our theme. There are a few images and a css file. If you decide to further customize the slider we recommend you do your customization only by using CSS. Insert your CSS codes in the custom.css file. Then you can keep the original slider files, our modifications unchanged and still have your changes. Blogroll home page – Default page template, Posts slider, a widget area with the post list – blogroll-home-page-codes.txt. The widget area can be create with the Sidebar Widget Manager or the Widgetize Pages Light plugins. The post list in that widget area can be created with the Smart Post Lists or Smart Post Lists Light plugins. See the Recommended plugin section above for more info on the plugins. The rest of the pages on the Demo site have a page template you can use when creating a new page or have a template with auto-generated content like post archives. To add custom css we recommend you edit the custom.css file. This can be done in Appearance -> Editor -> custom.css. Keep a copy of that file before you update your theme so you don’t loose the changes on update. The logo can be changed from the interface in Appearance -> Header. Where /images/favicon.ico is your fav icon file uploaded in the images folder of the theme. The copyright text can be edited in the footer.php file. See the Page Templates section -> Page Contact. To have nice URLs you can set them up in Settings -> Permalinks -> Custom settings. We recommend you use Post name. When you add or edit page/post/portfolio there is a metabox called Page title settings. If this is not visible enable it from Screen options button on top right corner of the page. Then enter the sub-title in the field. It will be displayed in the Page title area right next to the page title. When you add or edit page/post/portfolio there is a metabox called Page title settings. If this is not visible enable it from Screen options button on top right corner of the page. If you want the whole page title area hidden check the checkbox. Create a page and then go to Settings -> Reading. Choose A static page under Front page displays, then select a page in the Front page dropdown. This will make your page a home page for your installation and it will remove the breadcrumb bellow the header. You can also remove the whole page title area – see “Hide page title area” above. Check out the Recommended plugins section above. This theme comes Localization/Internationalization ready. It is following WordPress I18n standards.